It is almost normal for every Nigerian to frown at sales/marketing jobs. This is really ironical because sales/marketing is the core of every business that wants to thrive. Since the main purpose of any business is profit making, then being a part of the profit drive is one position that everyone supposed to be happy doing, but the reverse is the case here in Nigeria. Now the big question is why do Nigerians frown at sales/marketing positions? The major problem Nigerians have with sales and marketing position is simply assumption and misunderstanding. Many Nigerians don’t understand what sales and marketing really mean that is why many resent it. “Assumption” they say is the lowest form of knowledge, so to clear your doubts we have put together “facts and myths about sales/marketing roles in Nigeria” to give you a better insight into sales/marketing roles in Nigeria. 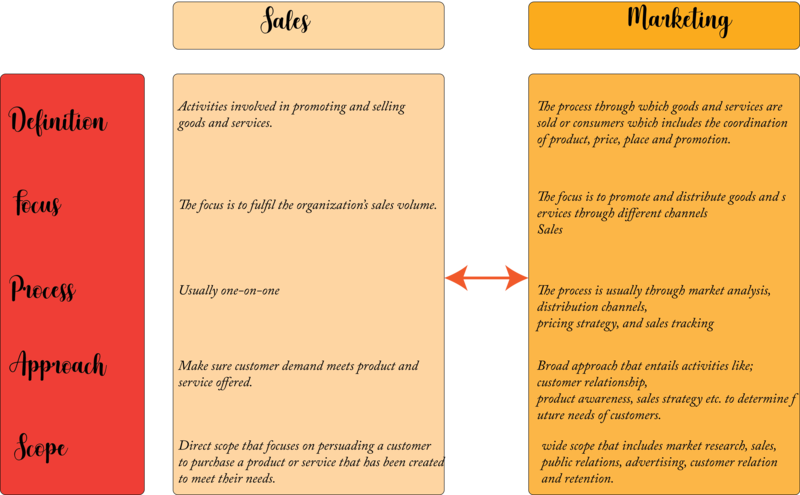 What is sales and marketing all about? Sales and marketing is the core of every business. The sales and marketing umbrella covers the most vital part of every business which covers; advertising, public relations, promotions, and sales. Even if sales and marketing have to exist together for the real essence to be realized, they also perform different functions while marketing is the process by which a product or service is introduced to a potential customer, sales has to do with the measure of a business success. Since having a great product is not the requirement to having a successful business, then the main success of the business rests on its sales and marketing strategy because marketing at the beginning drives the awareness for a potential sale, and sales on its own drives the profit and ultimately the success of a business. Without sales/marketing, a business may crash. Sales and marketing revolve around driving the vision of a business to make a profit and succeed. Sales and marketing are closely interlinked that is why many people find it difficult to differentiate them since they both aim at increasing revenue. Since sales and marketing are closely intertwined, it becomes somehow difficult to draw a point of difference. As closely intertwined as they can be, there are still major differences between them. Just like we said earlier that almost every Nigerian will frown at a sales/marketing job, it is resultant of many misconceptions about sales and marketing roles in Nigeria. Employers and employees in Nigeria see sales and marketing jobs in a way that is totally different from what it is actually. Nigerian employees see sales and marketing roles like a role that is meant for people that don’t have a choice anymore. They see sales and marketing positions like the last resort when every other thing has failed. It has become so bad that many Nigerian employees see sales/marketing roles as jobs meant for only desperate people and not necessarily a career role that someone will decide to do willingly. You can’t blame the employees, because many Nigerian employers gave them many reasons to see sales/marketing positions in that light. Nigerian employers see sales/marketing roles as one that is meant for people without choice, so they treat them like people without choice really, frustrating them with unrealistic targets, compensation is basically based on commission which is usually low. So looking at Nigerian employees and employers view of sales/marketing we can categorically say that there is a big misconception about sales/marketing roles in Nigeria. We will take a look at the myths and facts about sales/marketing roles in Nigeria in this article. As the core of every successful business, sales and marketing roles have amazing career opportunities for anyone with the right mindset and information. The problem is that as important as sales/marketing may be, there are still lots of myths that surround these roles in Nigeria. So these are a few of the biggest myths about sales/marketing roles in Nigeria and what it really is. Many people think that sales/marketing jobs are just based on very low commissions in Nigeria. The truth is that there are many sales/marketing jobs that are not just based on commission at all. There are many sales/marketing jobs in Nigeria that are not based on commission alone. Many sales/marketing roles have basic salaries. The essence of the commission is to reward hard work based on a number of leads. The commission is added to the basic salary depending on how much money you can generate for the company in a month. Which means that no matter how much revenue you generate your commission will still be on the increase. Many Nigerians have the mindset that all sales and marketing jobs are the same regardless, but that is not true. All sales and marketing jobs are not the same because even in the job field as a whole there are still different job roles. Sales/marketing exists in different industries which makes it function differently across this industry based on the product or service. There is a very popular belief in Nigeria that no one wants to actually take up a job in sales and marketing. That is false because there are still many people that are passionate about sales and marketing roles. Many successful business/sales/marketing managers in Nigeria have built very successful careers in sales/marketing. Many Nigerians believe that job roles in sales/marketing are worth being ashamed of. When you say that you are pursuing a career in sales and marketing many people in Nigeria will see it as not dignifying enough, it is something you should rather be ashamed of. The truth is that sales/marketing roles are job roles that one should be very proud of because it takes a lot of skills and passion to directly influence the revenue of a business. Many Nigerians believe that you don’t need to be formally trained to become a good salesperson. People even think that salespeople are born and not necessarily made. This notion is wrong because sales/ marketing professionals acquire different pieces of training to improve their skills. Many people in Nigeria believe that great salespeople are born and not made because they have the mentality that you don’t need a formal training or certification to become a sales professional. That notion is wrong because top sales skills are acquired and taught. So, a person can be taught those skills and become a great salesperson. The fact that people think great sales representatives have been able to develop traits like; charisma, persuasiveness, listening skills and etc. but that is not true because the best sales professionals got to that point by acquiring some form of training and skills to become what they are in their career. There is still one thing that many Nigerians don’t get right about sales and marketing positions. Many people think that you have to be extroverted to become a successful sales/marketing person. That is not true at all because a salesperson doesn’t need to be an extrovert before the person can excel in sales and marketing. Even though it is important that a sales professional should enjoy working with people, being extroverted doesn’t ensure that you can work very well with people. After all charisma and eloquence will not help you hit your target. Introverts have a great listening ability which is an amazing skill that can help you build great relationships with clients. Many Nigerians believe that salespeople are everywhere and that everybody and anybody can be a sales/marketing expert. That is not true because great sales/ marketing experts are scarce to find. If that is true, employers in Nigeria will not even find it hard to get great sales professionals to join their team. Good sales/marketing executives are still hard to come by. You need to be intelligent, hardworking and even have the necessary training to thrive as a salesperson. So, sales/marketing as a job field doesn’t just pass for what anyone can do, it is rather a job field that requires a lot of skills and training. Taking up a job role in sales/marketing doesn’t mean you will be poor. That is a very wrong mentality, there are many sales/marketing experts that are very wealthy today. Job roles in sales/marketing don’t put you in any form of disadvantaged position that will reduce your earning power. Job roles in sales and marketing gives you the opportunity to even earn more because most of the time you will be based on commission aside your basic salary. So it is even an opportunity to earn above your basic salary. Some people think that taking up a job in sales/marketing can influence your personality negatively. Many Nigerians see sales/marketing experts as liars so they think that for you to thrive as a sales/marketing expert you have to become a lair sort of, but that is not true at all because selling a product has nothing to do lying. As a sales/marketing expert, you are to tell people about using your product or service not lying about anything. You are to pitch and not give a wrong information. It is fraudulent to lie about a product or service. Performing a role in sales and marketing aids your personal career growth in Nigeria. Some job fields may not aid the practice of the job role. Sales/marketing roles are job roles in Nigeria that will give you the opportunity to grow in your career because you will have the opportunity to practice every day. A sales/marketing expert will keep getting better as he/she sells or markets every day. Taking a job in sales/marketing allows one enjoy job freedom to an extent. Most sales/marketing positions don’t require you to do the usual 9-5pm work schedule, but rather you can choose to work at your convenient time. One core fact about sales/marketing roles is that it allows you to be financially free because you can decide to earn what you want to earn. Sales/marketing roles are the only roles that can give you that financial freedom that you desire without necessarily having your personal business. Just like some other job fields in Nigeria, sales/marketing roles offers one great career growth opportunity. Having a strong sales career, you can climb up the ladder and become even more successful in your career. If you are thinking of changing your career, taking up a job role in sales and marketing will help you develop great skills that will helpful across any job field of your choice. Job roles in sales/marketing give you the opportunity to acquire several transferable skills that will give an edge over thousands of people in Nigeria. You will acquire transferable skills like; entrepreneurial skills, time management skills, communication skills, public speaking skills and etc. Sales/marketing is one job field that offers a great deal of reward for success. Unlike other job roles that whatever you do is still somehow included in your salary, but with sales and marketing related job roles that is not the case. If you perform well in your job, it will surely reflect in your pay at the end of the day. Sales/marketing related roles work differently from other job fields. The more you are able to promote/sell your product or service the more commission you will end up getting. Many people think that sales is all about talking about your product to a potential client. That is a wrong impression, sales have a lot to do with listening well to prospective client concern and thinking critically about how best to address their concerns paying attention to their questions. Successful sales/marketing experts don’t just believe in pitching their product, they listen well enough to what a potential customer needs and how to fashion a means to pitch the product or service to meet that particular need of the person. As the world experience advancement, we also experience advancement in career. Over the years some careers have gone extinct and some are going extinct as the years go by. One job field that will never go extinct is sales/marketing. Since the importance of sales/marketing cuts across different industries, it is difficult for it to go extinct even if it will undergo some changes. Performing a role in sales/marketing could be a great source of motivation for many. People need the drive to do more or to perform better. Taking up a job role in sales/marketing can be the motivation you need to thrive in your career. In sales/marketing related roles, you earn more when you perform more which is a great motivating factor. Since you know that you can earn much more based on your performance, you will always be willing to do more so that you can earn more. Since most job roles in sales/marketing are commission-based it makes it easy for people to control their income. The opportunity to control your income is one that other job field can’t offer which is a great opportunity. In sales/marketing related job roles your income can’t be affected by another person’s ineffectiveness or mistake. In this job field, your income ability is in your own hands as you can decide when you want to make more or less. Aside from fulfilling one's passion, the essence of taking up a job role is to be able to cater for your needs. Being passionate about sales/marketing positions is not all there is to earning well in this job field in Nigeria. With your passion for the job field, your ultimate success will be determined by your ability to get tangible results in the cause of doing what you like. To develop and make it in every career, you must, first of all, develop the right mindset towards what you are about to go into. Developing the right mindset is developing a positive mindset towards your job. Having a positive mindset is loving your job. It may be hard to succeed in sales/marketing or any job field if you don’t love what you do. To become a successful sales/marketing expert you would have to develop a love for promoting marketing strategies, gaining sales leads, talking and listening to prospective clients that is when you can earn well. A sure way to increase your earnings is to acquire great skills that will help you perform better and more. To earn higher than everyone else is to take advantage of your job role as a sales/marketing expert and make good use of it. Since many people in Nigeria don’t like sales/marketing related job roles, then this is an opportunity for you to tap into an untouched mine and increase your earning power. Acquiring more skills that will help you perform your task as a sale/marketing expert will definitely put you in a better position to earn well. To make it in sales/marketing you really need to work hard. Working hard as a salesperson does determine your success rate. What you should know about working hard is that hard work is not about being too hard on yourself. Hard work is about putting in your best effort in the right direction because the quality of your effort is much more important than the quantity. Working smart is a step higher than working hard. While hard work will bring a result, smart work will even bring a greater result. Smart work involves tailoring your effort to result-oriented activities that will help you in performing your task easily this include spending time in acquiring new skills that can help you perform the job better. You can only work hard or smart when there is something you can try your hands on. One way you can start increasing your earning power is to start searching and applying for sales/marketing related jobs. I know the next question is how can you search and apply for jobs. Online job boards like MyJobMag make it easy for people to search and apply for the jobs of their dreams with just a click. So you can simply apply for sales/marketing jobs on this platform with no stress all. It is important for you to search and apply for sales/marketing so that you can have a basis for your growth and development. It is not enough to build your conclusions based on mere talks that you hear people say or common myths. Before you take any career decision it is important for you to take out time to get the right knowledge before jumping into conclusions. Building a successful career in sales/marketing is an untouched goldmine in Nigeria, that when you tap into can amount to great success.